Glenn Ferguson believes that tonight’s Toals COunty Antrim Shield triumph was even better than Ballymena United’s previous win in the competition three years ago. 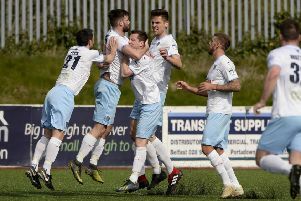 The Sky Blues boss was thrilled with his side’s 3-2 victory over Linfield as he claimed his second trophy in his four years in charge at the Showgrounds. Ballymena United celebrate as they lift the County Antrim Shield after beating Linfield 3-2. Picture: Press Eye. “It’s actually a better one for me because, having gone to another two cup finals since then and lost, you think ‘are we in this rut where we’re going to lose finals?’. “I’m not sure what price we were in the bookies but we were massive underdogs so this one is better for me. “The first one as a manager was good but this one is really good to beat Linfield at their home ground. “When you get to a cup final, your ultimate goal is to win the trophy and we’ve done that. Ballymena manager Glenn Ferguson celebrates with son Matthew, who came on as a sub, after United beat Linfield 3-2 to win the Toals COunty Antrim Shield. Picture: Press Eye. “People say we harp on about it but at 1-0 we weren’t under a lot of pressure and then Linfield are awarded a free kick that was never a free kick and it cost us a goal and two yellow cards. Ferguson also paid tribute to unlikely goalscorers Paddy McNally and Eoin Kane for their contributions. “I’m delighted for Eoin Kane making a break into the box and he produced a great finish in off the crossbar. “I’m not a particularly superstitious person but I said to Lee Doherty at half-time, the last time we won the Shield it was a centre-half in Davy Munster who scored for us. “Paddy had an excellent game, he defended well, shackled Guy Bates for most of the game and he’s got a goal as well which he wasn’t expected to do. “There are a lot of players who go unnoticed on nights like this - people will talk about Cush’s goal but I thought Stephen McBride was excellent and our two central midfielders, Gary Thompson and Gavin Taggart did really well. “I challenged them before the game because if Jamie Mulgrew dictates games for Linfield, they generally win and for large parts of the game we kept him and Sean Ward quiet. “When we looked at the stats from Saturday and analysed the game afterwards, Kirk Millar and Matthew Clarke got a lot of crosses in the box and we felt we had to nullify that because that’s where the danger was. “You don’t have to be a genius to know that a lot of teams play 4-4-2 and it works for them. On Saturday we played 4-3-3 and it almost worked until right at the end but tonight we changed the system and maybe surprised Linfield a little bit. “There was some good defending but I’m really pleased that crossbar at that end of the pitch is an extra inch thicker than the rest of them! “When things like that happen, you think luck is going your way on the night but it wasn’t all about luck - there was some resolute defending as well,” added Ferguson.